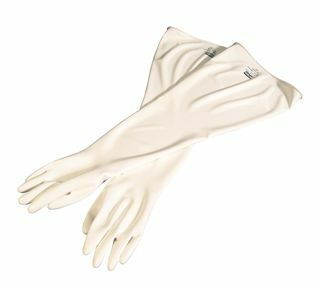 Honeywell Safety 8Y1532/10H CSM™Glovebox Gloves, Polyurethane, 8" Dia Cuff, 15mil, 32 In, Hand Specific, White, 10 | Products | Personal Protective Equipment | Hand & Arm Protection | Glovebox Gloves | Scientific Sales, Inc.
CSM™Glovebox Gloves. Outstanding abrasion resistance. Superior resistance to ozone or oxidizing chemicals. Naturally soft for greater worker comfort. White surface for good visibility; will not hide contamination. Hand specific or ambidextrous, available in a variety of port diameters and sizes.